Adam Johnson came off the bench to provide the catalyst for Sunderland’s first win over Manchester United in 13 years, and the champions’ third consecutive defeat. Gus Poyet set his Sunderland side out in their usual 4-1-4-1/4-3-3 shape, but had the ability to make wholesale changes to the defence that lost 1-0 in the league to Aston Villa last week. Dodgy centre back pairing Modibo Diakité and Valentin Roberge were both ditched in favour of returning Manchester United alumni John O’Shea and Wes Brown. Phil Bardsley, who is having an excellent season at left back, was shifted to his preferred right back position, dislodging Ondrej Celustka. Loan signing Marcus Alonso, formerly of Bolton Wanderers and currently of Fiorentina, made his debut at left back. In midfield, Lee Cattermole retained his place in front of the defence, despite his nightmare performance against Villa (where he was at fault for the goal and subbed off at half-time). Seb Larsson came back in to the side in place of Jack Colback. Fabio Borini replaced former Manchester City conqueror Ji Dong-Won. David Moyes again opted for the 4-1-4-1/4-3-3 formation that failed him against Tottenham. Seven changes were made from the side that lost to Swansea in the FA Cup. De Gea returned in goals. Rafael returned from injury at right back, with Nemanja Vidic replacing the crocked Rio Ferdinand in the centre. Patrice Evra resumed his role at left back in Alexander Buttner’s stead. Ryan Giggs started alongside Tom Cleverley in midfield, with Michael Carrick sweeping behind. Wonderkid Adnan Januzaj replaced Shinji Kagawa on the left. United looked totally disjointed from early on, and were unable to move the ball forward effectively. Michael Carrick was free in front of the defence to play balls forward to Giggs and Cleverley, but both players fell victim to the pressing of Larsson and Ki, with Sunderland safe in the knowledge that they had Cattermole covering behind. In the first 22 minutes Giggs only completed 67% of his passes (pathetic for a centre midfielder), and Cleverley had been dispossessed or lost the ball through a poor touch 4 times. With one quarter of the game elapsed, the away side had only enjoyed 39% of possession. This despite signalling an intent to control the game by pressing Sunderland’s centre backs. It was their disjointed shape and profligacy in possession that was letting them down. Only 74% of their passes found their target, an incredibly low number for a Manchester United side. Why the seemingly arbitrary selection of the 22 minute mark? It was at this point that Moyes acknowledged his error and changed the shape. Adnan Januzaj moved into the number 10 position, with Giggs going to the left. Immediately, the Belgian went on a mazy dribble through the centre, past Larsson and marker Cattermole, before being brought down by Phil Bardsley. Gustavo Poyet had been keen to get his hands on a genuine left-back and now that he had Alonso, he was going to use him. 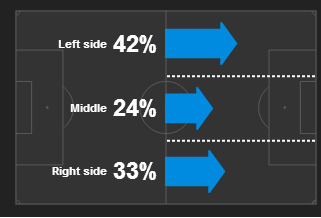 Sunderland funneled most of their attacking play (42%) down the left side. The combination of the overlapping Alonso playing behind the right-footed Borini was working well in the early going, as Borini looked to come inside on his stronger foot, giving the Spaniard plenty of room to put in some really dangerous crosses. It was bizarre then that midway through the first half, Poyet switched his wingers, moving the ineffectual Emmanuele Giaccherini over to that flank. He stayed much wider than Borini had and combined with the fact that United were now territorially in the ascendancy, this prevented Alonso from exerting any further attacking influence on the game. Credit also, to United’s right side. Although ineffectual from an attacking perspective, Antonio Valencia made 6 tackles and 4 interceptions during the game, (with Rafael behind him contributing 2 tackles and 5 interceptions). An important contribution from the Ecuadorian, given his horror shows as an auxiliary right back recently. In the ten minutes after the change of shape, United assumed control of the game, enjoying 70% of the possession. The switch to 4-2-3-1 allowed them to move the ball better, and prevented Sunderland from moving it as effectively, with Cattermole now being occupied by Januzaj. In the 43rd minute, Januzaj played a lovely 1-2 with Welbeck on the left hand side of the area, taking Cattermole out of the game, before delivering a low cross across the six yard box, that was brilliantly cleared by the sliding Wes Brown. Things were looking up for United. That man Brown had other ideas. In injury time, Sunderland won a free-kick in a right of centre area inside the halfway line. Sebastian Larsson executed a fine delivery to the back post. Amazingly United had left Wes Brown unmarked (and the other centre half O’Shea was being marked by the diminutive Rafael). He put the ball across the six yard box, where Giggs turned into his own net, in an effort to prevent Bardsley from scoring. The away side equalised soon after half-time however. In the 52nd minute, a Tom Cleverley corner was headed in by Nemanja Vidic after he lost his marker O’Shea. This was a game of no clear-cut chances from open play. Both sides had now notched from a dead ball. There was one more to come. Sunderland made a key change after the equaliser. They hauled off Giaccherini, moving Borini back to the left, and introducing former Manchester City winger Adam Johnson on the right. Johnson is a rather one-dimensional player. He likes to play on the right, cut in on his left, dribble and shoot. He’s basically a dirt-poor man’s Arjen Robben. Oh this occasion though, he came up trumps for his side. In the 65th minute, Johnson received the ball on the right flank. He dribbled into the pocket of space behind the advanced Tom Cleverley (how many times has a sentence like that been typed this season?). Cleverley chased him down and brought him down illegally just inside the area, tackling with his right when it seemed more appropriate to sweep with the left. Fabio Borini scored the resulting penalty. United had switched to a more 4-4-2ish shape by this point, with Januzaj playing off the shoulder. For those keeping count, this was their third formation used in the game. Still no clear cut chances materialised. Fletcher was subbed on for Cleverley for the last 15 minutes, and showed more signs that he may be capable of adapting to a more distribution-based role, with 3 key passes in his time on the field. There was to be no Ferguson-era siege with the creeping air of inevitability that went with it however. All United were capable of in the closing minutes were aimless punts into the area, meat and drink for Brown and O’Shea. The days of late winners and equalisers stemming from rapid triangles and overlaps on the flanks are gone. Sunderland performed exactly as Gus Poyet would have wanted. They prevented United from creating and got a couple from set-pieces. The performance of out-of-form subsititute Johnson was a huge bonus, as he mentioned in his post-match interview. Debutant Marcus Alonso was extremely impressive at left back, both from an attacking and a defensive perspective. Manchester United put in yet another disjointed and blunt performance. Moyes is clearly floundering and has confirmed the longstanding perception of him as a reactive manager – great at setting up his team to counteract the opposition strengths, not so great at imposing a philosophy that exploits the strengths of his own side. His jumping from one shape to another in this game is further evidence of that, and his post-match cries of unfair officiating smacked of desperation, particularly given the baffling refusal of referee Andre Marriner to dismiss Rafael for a clear second bookable offence. The reliance on Adnan Januzaj, an 18 year old, is somewhat misplaced. Although the young Belgian was United’s only bright spark in an attacking sense, he also showed how much development his game requires. He was dispossessed 5 times, lost the ball through poor control 4 times, and only hit the target with 1 of his 7 efforts. Wasteful. He has plenty of time of course. As for his manager, the clock is ticking.